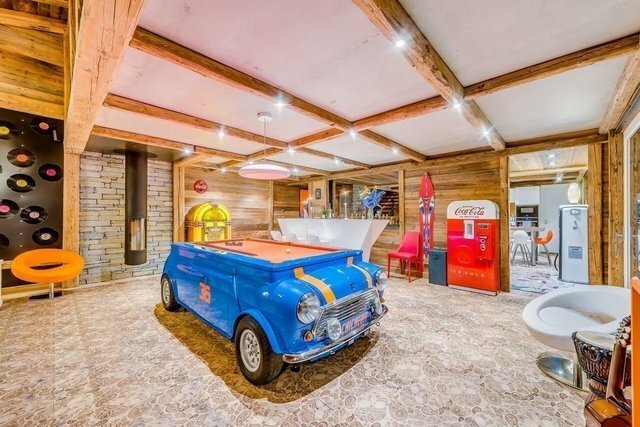 This incredible Chalet is located in Tignes les Brevieres just a short walk from the ski lifts and village restaurants the chalet can sleep up to 15 people across 5 individually designed suites spread over 430 sqm With a funky 70s theme it offers extensive living space with lots of grown up ‘toys’ The open plan living area boasts a unique mini car pool table, Wurlitzer style juke box loaded with 100 albums , original Marshall Amp and speaker with guitar for those who can play a tune or two. With ample lounge seating, dining area and a bar it really is a fun place to hang out after a hard day on the slopes. As if the living room in itself wasn’t enough there is also a gym with cross trainer, rower and kettle weights. A massage room with a hydrojet bed system and a small out side Jacuzzi and an indoor swimming pool. Méribel 3 Vallées Sotheby’s International Realty, expert in the sale of luxury chalet in the French Alps.